The price shown is one half down to get your Preamp on order. The JJ 243 is a standalone multi-channel preamp built as a companion piece for the JJ 322 Class A stereo power amp. It features the same hand finished wood trim and plated top control panel. It provides three standard line inputs as well as a separate phono stage with entirely separate circuitry. The line input utilizes two ECC82's and two E88CC's. The phono channel uses four additional E88CC's (internally) for a dedicated phono signal path. The phono channel features several input impedance and capacitance loading options to accommodate a wide array of cartridges from MM to low output MC's. This is user selectable via a dip switch on the rear panel. The JJ 243 is ideal whether you're feeding a pair of classy mono-blocks or a fire breathing push/pull power amp. You can choose the color combination you would like by clicking on the "Customize” button. 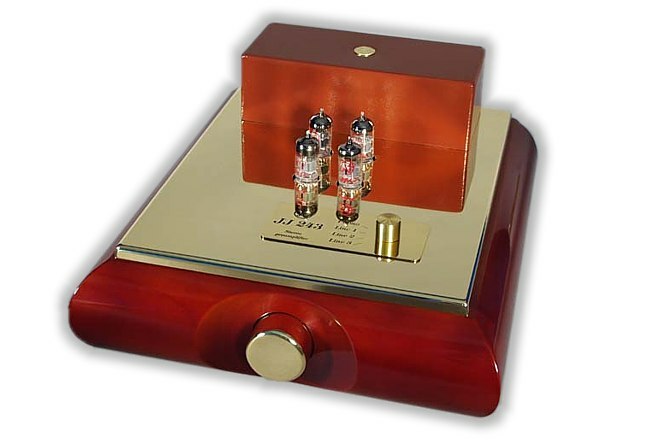 ***Deposit info: At this time all HIFI amps are sold on a custom order basis. The price shown in your cart is the deposit. Once we receive your deposit we will contact you to confirm the lead time and your choice of finishes. Shipping: The JJ 243 weighs about 25 Lbs. We typically ship them by FedEx 3 day service however we will contact you so can choose how you would like it shipped. Topology: Stand-alone 4-channel Preamp with phono stage. General: The JJ 243 multi-channel Preamp is designed to be used in conjunction with the JJ 322 Class A stereo power-amp. 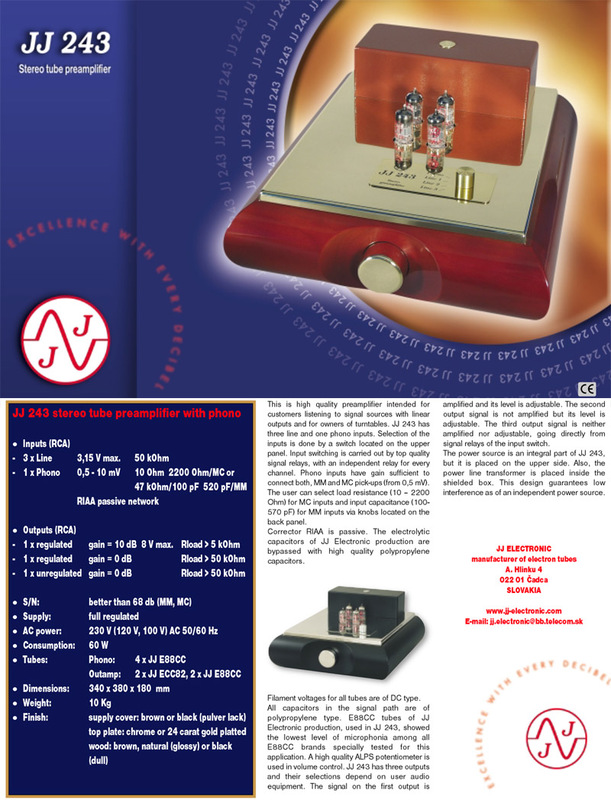 However it's equally suited as a standalone pre amp or phono stage preamp for most power amp applications. The preamp itself is finished to match the JJ 322 aesthetics featuring hand finished wood trim and plated control panel. This is one of the best performing standalone preamps we've ever auditioned. The versatility is second to none and the dedicated phono channel is stellar. The rear panel selectability for the phone stage configurations makes this preamp one of the easiest phono inputs to configure currently on the market. JJ uses a very clever chassis design to isolate the power supply from the input stages. This keeps the signal to noise ratio under 68db in the phono stages and even better in the line inputs.